Short on time? Let medium-machinery sellers contact you. 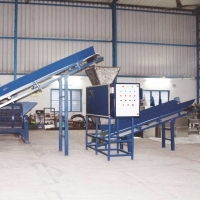 The use of polymer sand plastic processing equipment solves not just the polymer waste recycling problem but number of other problems (cleaning of urban landfills, environmental problems) and it is also arranging profitable production of building and finishing materials: paving and facing tiles, curbstone, various bas-reliefs and flowerpots , sewage manholes, roofing tiles, insulating sleeves for power cable, etc. 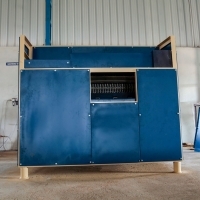 The machine for making the thermoplastic composite as result of mixing and heating the components of the polymer sand mix. After you get the received preheated mass out of extruder it is placed in a mold on a molding press to produce polymer sand finished product. 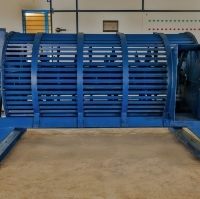 The machine is used in the polymer-sand complex. 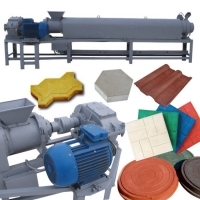 The extruder is suitable for the production of polymer sand materials: tiles, manholes, sewer covers, facing tiles and other building materials. Our complex of equipment is a modern high-performance equipment for the production of a wide range of polymer-sandy materials: construction, roofing, finishing and landscaping elements : Roof tiles - more than 100 m2 per shift Sewage polymer sand hatches and covers of inspection hatches (light, medium series): - more than 50 pieces per shift; Polymer sand sidewalk tiles, paving stones Polymer-sand tiles, facade, basement, terracotta tiles - in various shapes, sizes and colors Curbs, trays, gutters and other elements of improvement. HIGH EFFECTIVE ADDITIVE DISPERSANT DisperolÂ® 500H and DisperolÂ® 500A DisperolÂ® 500 used as a wetting and dispersant for inorganic pigments and fillers in aqueous systems, as well as for stabilization emulsion paints. It prevents thickening. Improves storage stability of highly pigmented dispersion paints. Dosage It is added in an amount of 0.1-0.8% of the total mass of water-dispersion paint. Compatibility with other additives DisperolÂ® 500 H is compatible with most different additives used in water-dispersion paints. The composition of the paint and the dosage of the additive must be determined by conducting laboratory tests. Storage and expiration date Store at temperatures between -5 C and + 40 C. Subject to compliance storage conditions, shelf life 12 months from the date in closed original packaging. 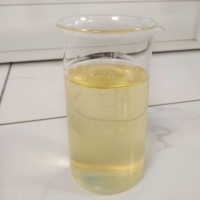 To not allow dewatering additives. Application � Interior water-dispersion paints; � Facade water-dispersion paints; � Highly filled and highly pigmented water-dispersion paints; � Homopolymers systems and copolymers polyvinyl acetate, polyacrylic and styrene / acrylic copolymer of dispersions. � Plasters; � Primers; � Sealants. Our welding extruders are designed for manual use or for work as an element of welding equipment for welding plastic parts of polyethylene (HP and LP), polypropylene, polycarbonate, polystyrene, ABS, PMMA, etc. 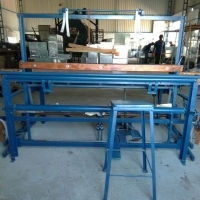 Welding extruders are widely used in repair work in industrial and domestic conditions for pipe connection joints, producing various containers, septic tanks, aeration systems, the compounds of waterproofing plastic sheet and film materials, elimination defects in plastic products and other purposes. The WHE-1/7 welding extruder is the most optimal model for welding equipment. It is equipped with a screw that has a special zone for creating high pressure. 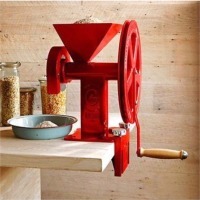 This machine can easily process pellets with a diameter of up to 5 mm. The capacity of the bunker of the welding extruder allows to obtain a continuous welding seam of any color up to 5000 mm long. 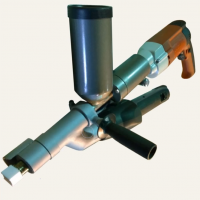 The body of the welding extruder is made of aluminum alloy so its weight is just 4.0 kg. 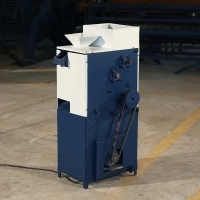 The welding extruder is equipped with a 2.45 kW dryer that ensures high speed and continuity of welding. 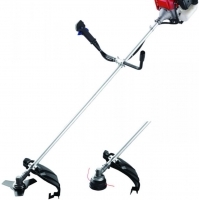 Cold water high pressure washer is a multipurpose cleaning equipment. In fact, high pressure washers are widely used not just for washing automotive and special equipment but it is also perfectly suited for cleaning surfaces in production, in agriculture, on construction sites, in communal services, etc. 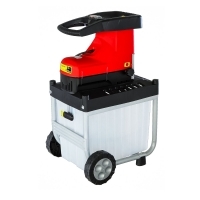 Our high pressure washers are the most practical and economically profitable. 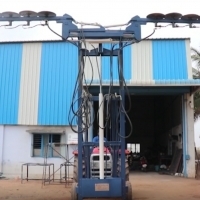 They are excellent at cleaning cars, premises and equipment. One more fact you would like to hear about them is that they are able to work for days providing high performance and that means there are no downtime expenses. The design features allow using these devices in extremely hard working conditions. So take a moment and think about it: 500 bar pressures in combination with 1050 L/h water consumption. High pressure and a water current let you to clean the surfaces from persistent contamination. 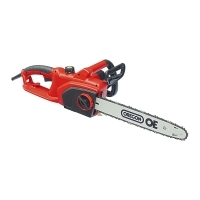 Excellent technical characteristics ensure trouble-free operation of the device with no fatigue. 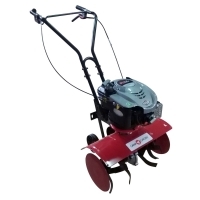 The machine was designed for daily work in difficult conditions. The brass cylinder head is resistant to cleaning agents and stainless steel pistons with ceramic sleeves guarantee a long lifetime. Unit equipped with the high-pressure pump Annoy Reverbery or HAWK with a crank mechanism, which has high performance and excellent resistance to temperature shock. The brass cylinder head is resistant to cleaning agents and stainless steel pistons with ceramic sleeves guarantee a long life time. Unit equipped with the high-pressure pump Annoy Reverbery or HAWK with a crank mechanism, which has high performance and excellent resistance to temperature shock. The pumps have ceramic pistons and a brass pump head. 4-pole Italian air-cooled engine equipped with thermal protection. The pressure regulator of the device allows to change the pressure for different cleaning tasks. 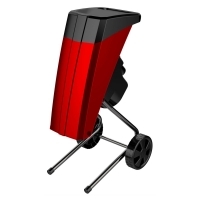 It is equipped with the gun holder and wheels with high tread for better need. It is also can be equipped with a drum for winding the hose. 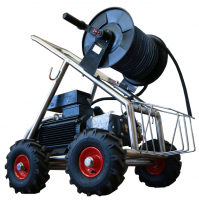 ( as an option) It is also possible to complete the kit with a hose reel for 20 and 40 m hose and a basket that is also made of stainless steel.